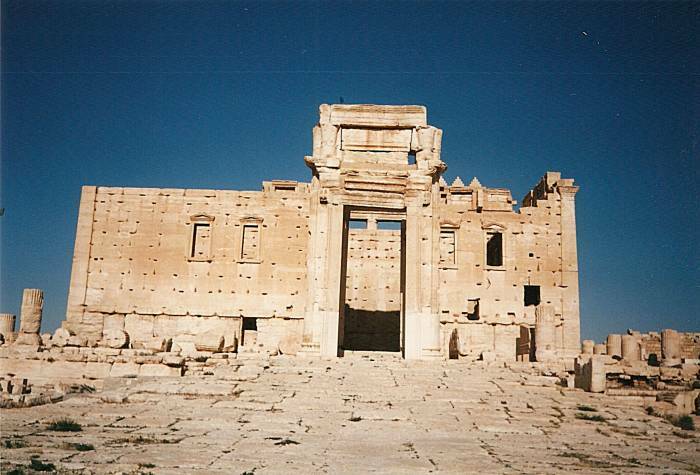 From Hamah or Himş you can go east into the desert to Palmyra, an absolutely amazing ancient ruin. Palmyra is the ancient name, Tadmur is the Arabic name and, at least officially, the name of your destination when you're asking directions. But if you tell someone at the minibus station at Himş that you want to go to Palmyra, they'll certainly know what you mean. See Tadmur (Palmyra) on the US DOD map above and Tadmur on the map below. It's pretty much all desert from Himş to Tadmur, a flat and yellow-grey haze of gravel and sand. No vegetation at all. 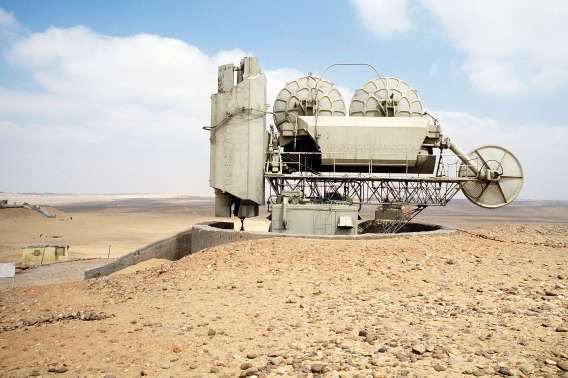 Check out the radar antennas right along the road as you transit the Syrian Air Force base at Tiyas, about two-thirds of the way from Himş to Tadmur. There were two six-over-six arrays of 6-element VHF Yagi antennas that looked to me to be in the 100-140 MHz range, a little bigger than those for the 144-148 MHz amateur band. These were mobile radar systems parked just off the highway where our minibus was stopped to make sure our papers were in order. The security check focused on the paperwork of some random local, and completely ignored the foreigner making notes on the radar antennas. However, I did not take pictures of the antennas. The ones here are from Wikipedia. 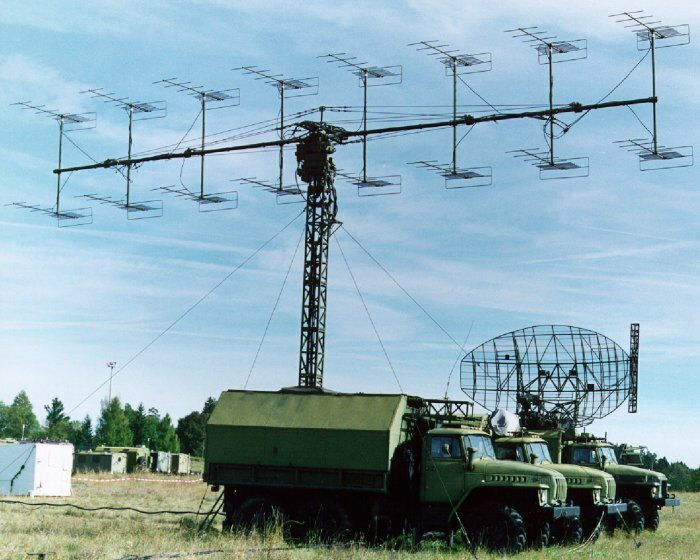 P-12 Енисей / Spoon Rest radar system with 12 VHF Yagi beam antennas. Later P-18 Spoon Rest radar system with 16 VHF Yagi beam antennas. 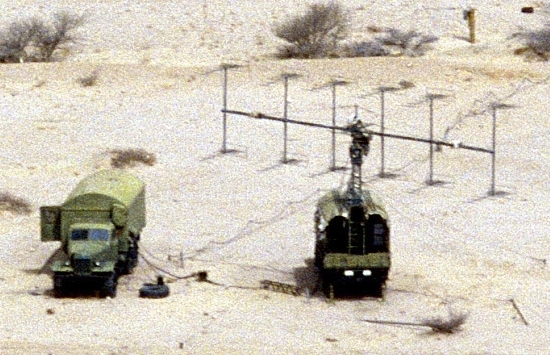 Fan Song 2-4 GHz radar system. Looking these up after I got home, a six-over-six array of 100-140 MHz VHF Yagis means a П-12 Енисей or P-12 Yenisei radar, a fairly old 2D VHF radar. Its original design dates back to 1956. However, the design has been updated many times and has evolved into the П-18 / P-18, itself heavily modified over its long service life. A Russian - Belarussian company sells P-18 upgrades today. This family of designs has been called Spoon Rest in the NATO reporting system. It is used as a search radar for the С-75 Двина or S-75 Dvina surface to air missile system, what NATO has referred to as the SA-2 Guideline and one of Syria's main air defense systems. One of the P-18 models seems to been responsible for shooting down the U.S. F-117A stealth attack fighter over Kosovo. This earlier stealth design is less effective against lower VHF frequencies. If you're curious, fas.org says that the P-18 has a pulse repetition frequency of 310 to 400 pulses per second, a pulse width of 4 to 6 microseconds, and the antenna scans at 2-6 RPM. Depending on the vintage and version, it has a range of 200 to 250 km with a precision of about one kilometer, and a power of 180 to 260 kilowatts. There's loads more details at an Austalian think tank's site. Those Spoon Rest arrays were sweeping. Some higher frequency dish antennas were static at the moment. Those were probably the Fan Song 2-4 GHz system. The Spoon Rest does early detection and the contacts are then handed off to the Fan Song acquisition radar. S-75 Dvina / С-75 Двина surface to air missile system, known to NATO as the SA-2 'Guideline'. 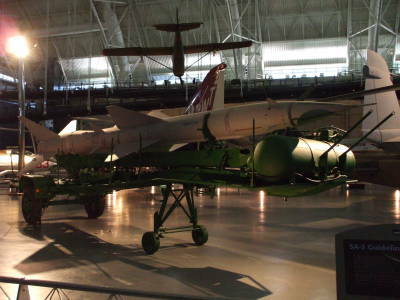 This was photographed at the National Air and Space Museum near Dulles Airport outside Washington D.C. The Syrian Air Force flies some high performance aircraft, although some are of fairly old design. The fighters, interceptors, and ground attack aircraft include the Mikoyan-Gurevich MiG-21, MiG-23, MiG-25, and MiG-29, and the Sukhoi Su-22 and Su-24. View southwest across the ancient city center. The city was mentioned in the 2nd millennium BC under its Semitic name of Tadmor or Tadmur (Amorite and Aramaic names referring to its military defense) in Babylonian tablets found at Mari, along the Euphrates. It was already a trading city in a network linking northern Syria with Mesopotamia. At the end of the twenty years which it took Solomon to build the Temple of Yahweh and his own palace, and to rebuild the towns which Huram had given him and settle them with Israelites, Solomon mounted an expedition against Hamath-Zobah and captured it. He also fortified Tadmor in the desert and all the storage towns which he had built in Hamath. He also built Upper Beth-Horon and Lower Beth-Horon as fortified towns with walls and gates and bars, also Baalath and all Solomon's storage towns, all the towns for his chariots and horses, and everything which Solomon was pleased to build in Jerusalem, in the Lebanon and throughout the territory under his rule. It was mentioned in the Hebrew Bible, where King Solomon of Judea, the son of King David, was given credit for its construction. The same verse credits him with storage facilities back in Hamah. Flavius Josephus repeated this claim that Solomon built it, and he also mentioned the Greek name of Palmyra. However, despite having picked up a Greek name, it seems to have escaped being absorbed into Alexander the Great's empire. It was an independent city isolated in the desert, becoming more wealthy and powerful. The Romans tried but failed to capture it in 41 BC. Map of the Roman Empire in 271 AD, the Palmyrene Empire portion shown in yellow. Palmyra was a very wealthy city by the first century AD, as it was a caravan stop on the trade route from Persia to the Mediterranean. The trade connections extended to India and China in the east, and throughout the Roman Empire to the west. 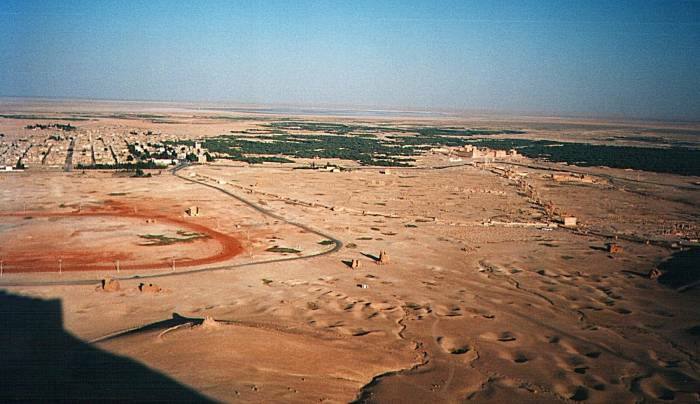 The city became known as the Bride of the Desert. Tiberius finally added it to the Roman Empire, at least nominally, in the first century AD. 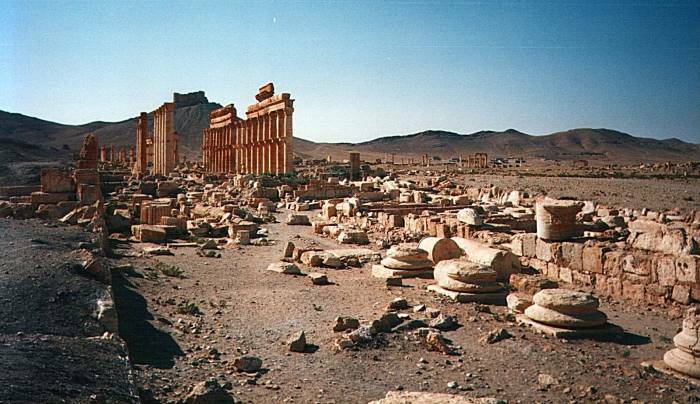 But Palmyra retained much of its independence. 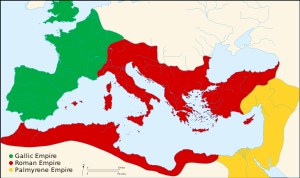 By the mid-200s, the Roman Empire was losing its power. The Sassanids were becoming powerful to Palmyra's east as the Roman Empire was breaking up and neglecting its frontiers. The Roman Emperor Valerian appointed a Prince of Palmyra, one Septimus Odaenathus, as the Governor of the Province of Syria. 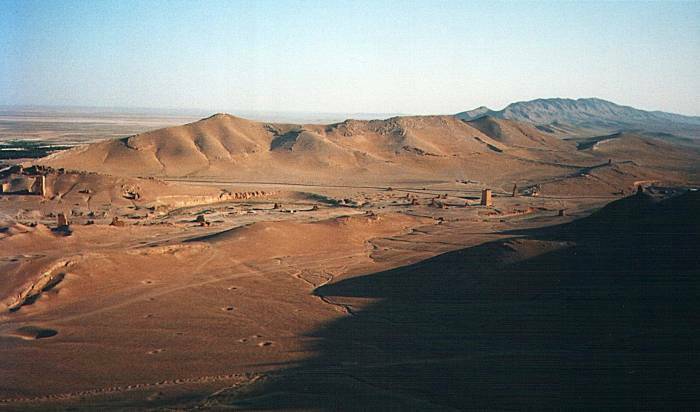 Valerian was captured by the Sassanids and taken east to Bishapur, where he died in captivity. Odaenathus took his forces as far as Ctesiphon, near today's Baghdad, and invaded that Sassanid controlled city twice in retaliation for Valerian's death. Then Odaenathus was assassinated by his nephew. His son Vabalathus was made king, getting the flowery titles of Rex Consul Imperator dux Romanorum and also Corrector Totius Orientus of Palmyra. 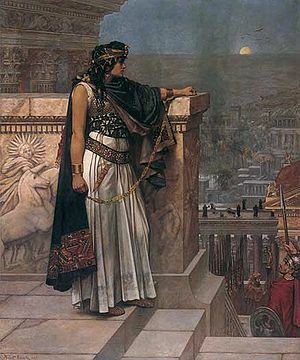 Zenobia, or Ζηνοβία, in Herbert Schmaltz's 19th century painting, "Queen Zenobia's Last Look Upon Palmyra". That sounds pretty impressive, until you realize that Vabalathus was an infant. His mother Zenobia was the real power behind the booster-seat throne. 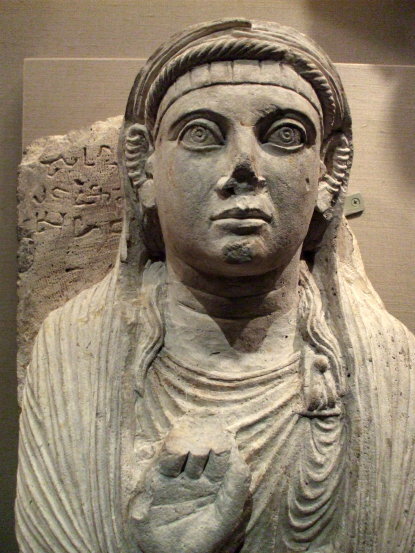 Zenobia, or Ζηνοβία in Greek, or in the much later and long-winded Arabic genealogical version, al-Zabba' bint Amr ibn Tharab ibn Hasan ibn 'Adhina ibn al-Samida'. Ruling and empire building suited her. She took power in 267. She became known as Zenobia the Warrior Queen, as by 269 she had captured the habitable parts of Egypt, the Sinai, Palestine, the rest of Syria, and up into Asia Minor to Ancyra to the west and to the edge of the Caucasus to the north. In Egypt she expelled the Roman prefect, Tenagino Probus. He led an attempt to recapture Egypt, and she captured and beheaded him. See the yellow area of what came to be called the Palmyrene Empire in the above map. No, it was Zenobia and not Xena. She led the army herself, riding and marching. They took control of the trade routes away from Rome, and eventually this got to be too much even for the wobbling late Roman Empire. Aurelian left where he was fighting in Gaul and brought together a large collection of forces to land near Antioch. The Palmyrenes were defeated and retreated into the desert. Aurelian's forces kept advancing. Zenobia's chief advisor Cassius Longinus was captured and executed by the Romans. Zenobia fled with her son, now maybe six, further east into the desert by camel. They were captured at the Euphrates River. Zenobia was brought to Rome, famously "in golden chains." Who knows, maybe that was true. It's fairly certain that she was paraded through Rome in golden handcuffs. However, Aurelian was so taken by her that he freed her and gave her a villa in Tibur, where she became a prominent figure in Roman societ. She eventually married a Roman Senator and they had several daughters who married into noble families. It's possible that Saint Zenobius of Florence, a Christian bishop in the 400s, was one of her descendants. All these exotic stories led to lots of references in literature, both direct and as allusions. Geoffrey Chaucer tells a short version of her story in The Canterbury Tales, for background and commentary on this see the notes to The Monkes Tale. Robert E. Howard used the name for a character in his Conan stories, a concubine who frees Conan from the dungeon of Xaltotun and later becomes his queen-consort of Aquilonia. She appears in the novel The Hour of the Dragon, sometimes titled as Conan the Conqueror. 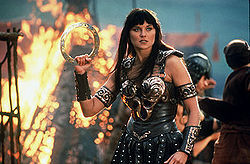 And, Xena: Warrior Princess has to have more than a little to do with Zenobia, the Warrior Queen. 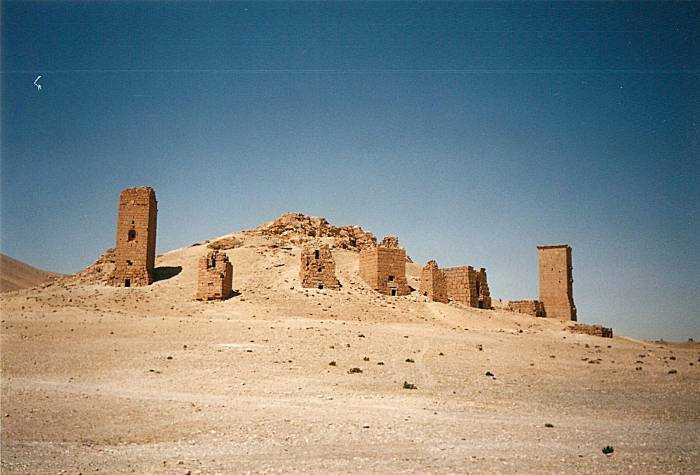 The Muslim Arab armies under Khalid ibn Walid captured Palmyra in 634. The Umayyad caliphs fell from power, leading to civil wars, and by 800 people started to abandon the city. It was held by the Burid emirs of Damascus during the time of the Crusades, although those wars stayed much closer to the coast and the land routes between Europe and Jerusalem. 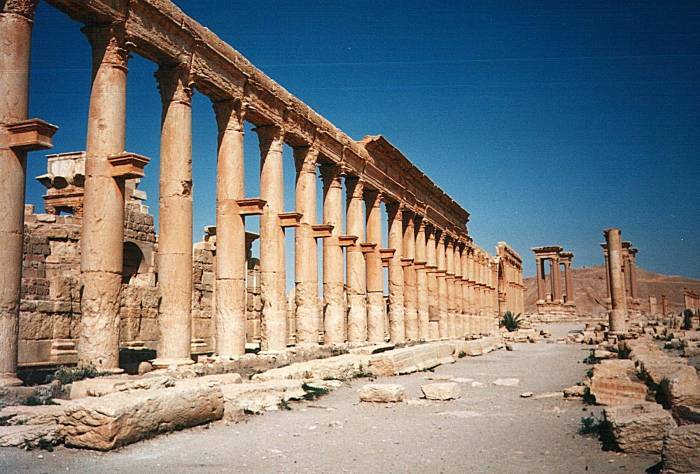 Tamarlane sacked Palmyra in 1401, but it recovered quickly. 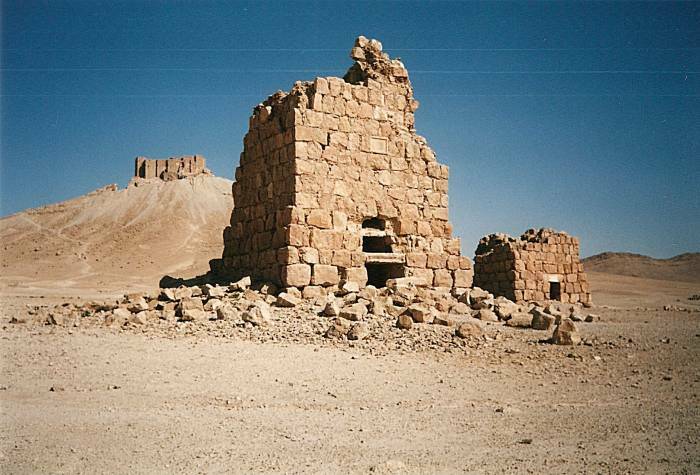 In the 1500s Fakhr ad-Din al-Maan II, a Lebanese prince who was trying to control the Syrian desert, built the castle Qala'at ibn Maan on a hilltop overlooking the ancient city. It's still surrounded by a 10-meter-deep dry moat. For a little baksheesh to a local at the gate you can cross a drawbridge and explore the castle. There are great views from its ramparts, and sunset is really spectacular. The Tetrapylon, or Four-Column monument, along the colonnaded main street. 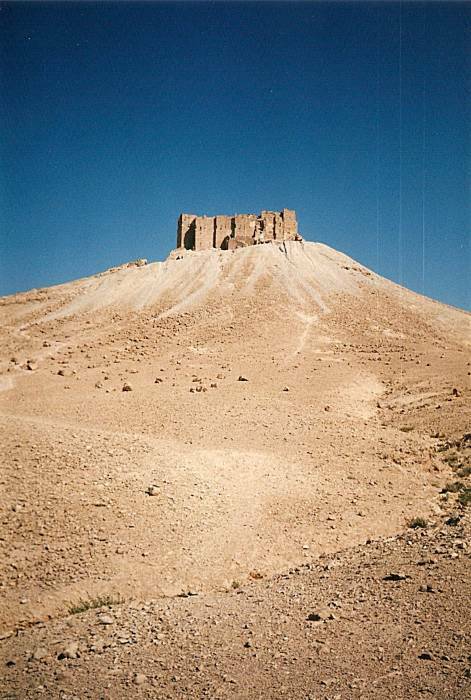 The hilltop fortress Qala'at ibn Maan. The city declined and was further abandoned during Ottoman rule, so that its location was unknown in the west by the 1600s. It was rediscovered by Europeans in the 1600s, and archaeologists began studying it in the 1800s. Outlying ruins seen looking north from the hilltop fortress. 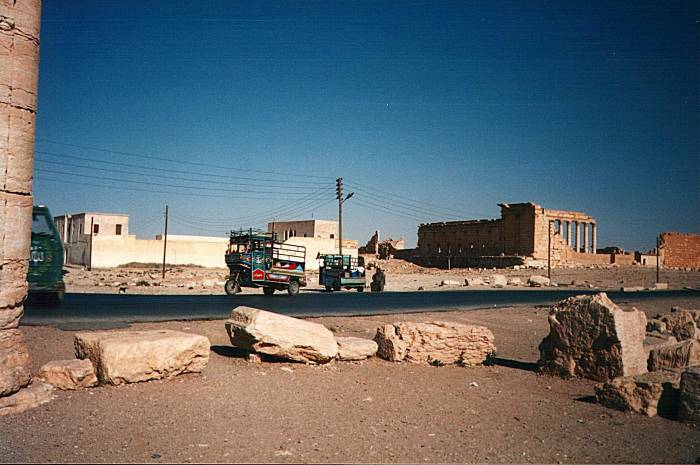 The modern town of Tadmur at the left, and the ruins of Palmyra at the right, extending along its main thoroughfare. Looking southeast, the Iraqi border is somewhere over the horizon. 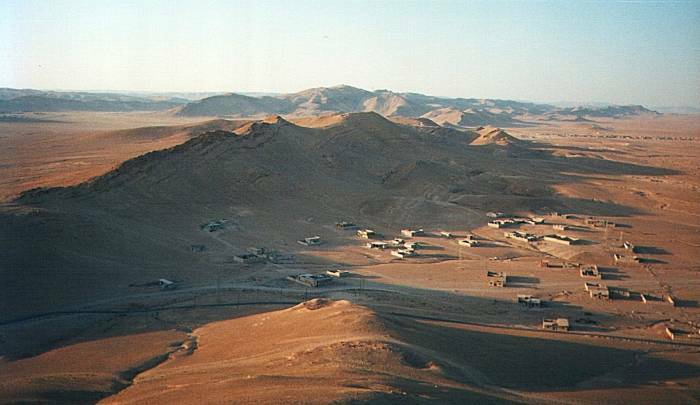 The Palmyra Air Force Base is out of view to the left and beyond the town. 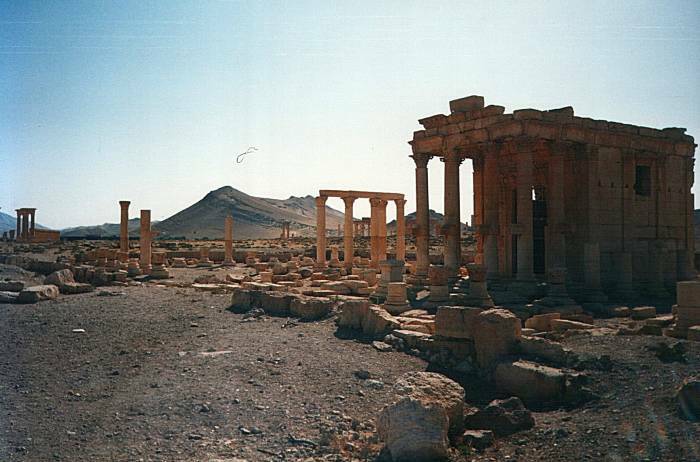 The highway from Himş cuts through the southeast end of ancient Palmyra, passing close to the Temple of Ba'al. The minibus will let you off in the center of town. There's not a lot of choice on budget housing at Palmyra. Hotel Afqa behind the PTT isn't too bad, but be ready for serious haggling! I stayed there on the recommendations of some Belgians back at the Hotel Cairo in Hamah, but the manager applied lots of gruff pressure to get a high rate for a grim room. At least the sheets weren't as gritty with sand as they had seemed to be at first. The two New Zealand girls I had been traveling with (New Zealandan? Novozealandic? Whatever. Kiwis.) had gone off in a different direction from Hamah, but I had linked up with yet another group of three girls from New Zealand. They had gone ahead and were staying at the Afqa, so I put up with the haggling for a not so good deal. It's pretty common when traveling to run into more people from New Zealand (population 4.2 million) than from the United States (population 304 million). On one trip I probably met four times as many people from the city of Vancouver (population 612,000) than from all of the United States. Americans just don't travel very much at all, which is unfortunate. I recently taught a class on network security in the Washington D.C. area. Everyone in the class worked for the U.S. government either directly or for one of the myriad Beltway contractors. I had the video projectors running a lunchtime slideshow of some of my travel pictures. Now, people who have been in the U.S. military for more than a couple of years tend to have been overseas and be fairly clued in about foreign countries and cultures. But a lot of the civilian employees are amazingly naïve and uninformed. I was showing some pictures from France, not a terribly exotic place. One of the students worked at the U.S. Navy's Space and Naval Warfare Systems Command, where civilian engineers and scientists work to develop systems to defeat sophisticated threats in the naval aerospace environment. Notice that this means understanding and anticipating Foreigners, Technology, and any combination thereof. Half-way through the lunch hour he asked, "Do they have electricity in France?" That's right, he figured that the major cities in France probably had electrical service, but he honestly didn't know if citizens of France outside the two or three largest cities had access to electricity. Remember that his job involves understanding and anticipating foreigners and their use of technology. I, and the students from the U.S. Navy and U.S. Coast Guard, about fell out of our chairs. Once we had explained that France had tamed the electron (and was decades ahead of the U.S. in nuclear power generation and distribution, and that the largely electrically powered French rail system makes America's look relatively primitive), another student piped up that she had gone overseas once. Oh? Where did you go? "One time when we were visiting relatives in Detroit, we drove across the bridge to Windsor, Canada, for part of the afternoon." If that's what U.S. government employees think "going overseas" means, that might explain a few things. 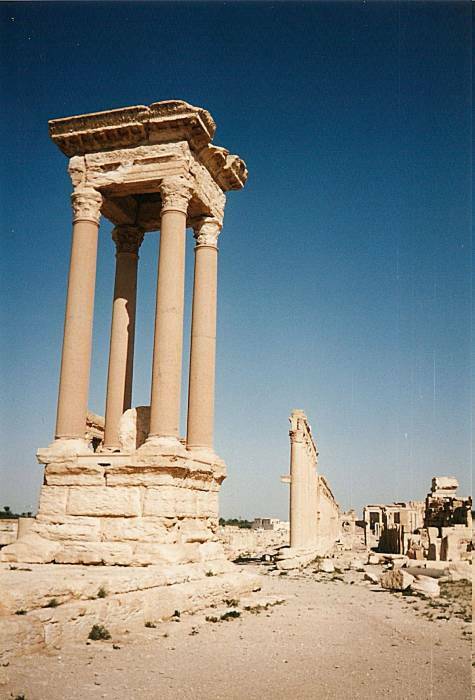 The Decumanus, a colonnaded street extending from the Temple of Ba'al through the city center. The Tetrapylon is just beyond the colonnade. 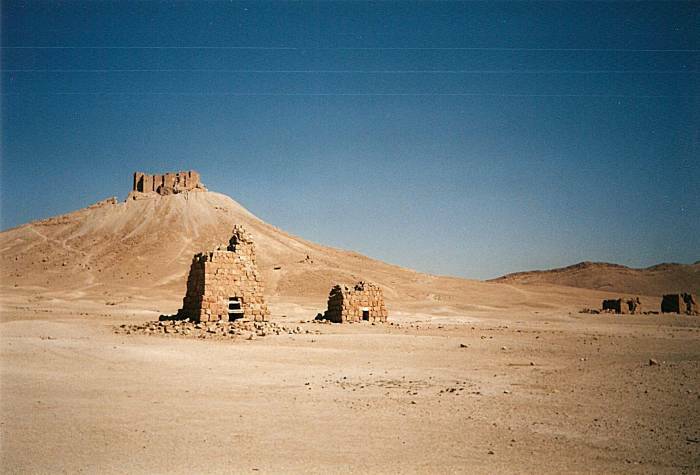 A smaller temple and the hilltop fortress Qala'at ibn Maan. Anyway, my three new traveling companions were Erin and Sarah, plus Kathleen, the more careful one.... Kathleen had gone to the store to buy some bottles of water, I ran into Erin and Sarah at the hotel. The three of them had been on the same minibus from Himş to Tadmur, but Kathleen had been sitting toward the back while Erin and Sarah sat in the center. A man in the seat in front of them introduced himself as a police officer returning to his home in a desert village out beyond Palmyra. While they had their backpacks stored in the open area beside the driver's seat, they had small daypacks in their laps. He had insisted on putting their daypacks in the empty seat between him and the window. Here was the point where even the seasoned traveler slips — they had reluctantly agreed. At the stop for paperwork at the Tiyas air base perimeter, he had even said, "I'll get your passports for you." Error number two, they didn't keep their passports on them at all times. 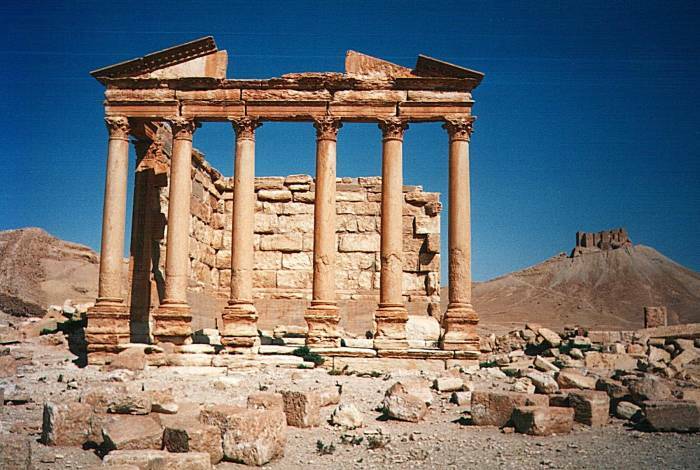 After getting out of the minibus in Palmyra they found that Sarah was missing approximately 2400 S£. Not a huge amount, just under US$ 60. They realized their errors and considered it a lesson learned. They did want to file a complaint, not in the hopes of recovering any money or bringing anyone to justice, but to make the point to the bus company that such things might occur on their lines. This was surprising, you generally just do not hear much about theft in the Middle East. I had been met by a fairly sophisticated tout when I first got off the minibus. 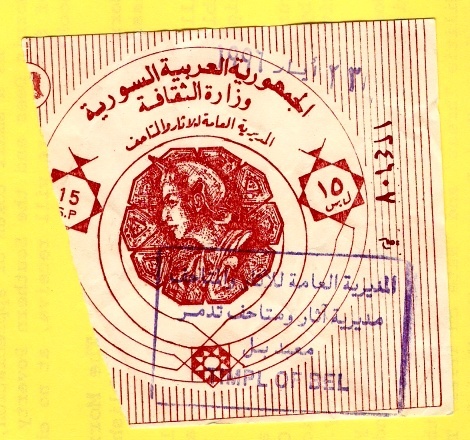 Mahmoud Assad nominally worked for the Hotel Al-Nakel but he saw himself as the ombudsman of Palmyra. Thanks, your place sounds nice, but I'm meeting some friends who are staying at the Afqa. Kathleen returned, and the three girls and I walked into the center of town to get lunch. Returning, we ran into Mahmoud. He enquired as to how I was doing since I last saw him, I introduced him to the Kiwis, and he asked them if he could be of any assistance. One of the outlying structures. Erin and Sarah said something about the theft and their desire to file a report with the bus company, and Mahmoud said, "Quickly, to my automobile!" Kathleen and I thought that his might get interesting, so we tagged along. All of us piled into Mahmoud's ancient Dodge parked on the central square. We first went to the office of the bus company, a tiny booth in a small park off a side street. Mahmoud related the entire story to them. The immediate suspicion was that the driver or his assistant (whose only function was to collect fares) might have been in on the scheme. Mahmoud did not get what he considered a satisfactory response from the bus company, so we continued to the police station. Mahmoud assured us that he knew the commandante of the police. I doubt there's much of anyone in Palmyra that Mahmoud doesn't know. This was getting more interesting yet, a rare opportunity to witness the operation of the Syrian police force without being in a horrific situation yourself. You enter the police station through a discreetly labeled all-metal door in the side of a building. The police offices are up a narrow flight of stairs. Mahmoud first talked with the dispatcher. He was dressed in a thin cotton dress-like robe and smoked incessantly. They reached some decision, and the dispatcher used an ancient telephone switchboard to call the police stations further out into the desert. The switchboard was of 1930's technology, with cloth-insulated plug wires and a hand crank for ringer voltage. He then used a radio, maybe of 1950's vintage, to contact another police station. Looking northwest from near the Temple of Ba'al along the main street and the Decumanus. The highway from Himş cuts through the southeast end of the site, separating the Temple of Ba'al from the main part of the ancient city. There goes one of the common three-wheeled vehicles. With the wheels in motion, Mahmoud then took us to meet the commandante. He was sharply dressed in a military style officer's uniform, and had a corner office overlooking the street. We were ushered in, asked to sit on a narrow couch, and offered cigarettes all around. The commandante's office was not as bleak as the dispatcher's room, but it was still pretty rough and dust-blown. Scariest of all were the all-steel solid doors on the holding cells down the hall. Each was one solid panel with a a small peephole and a narrow slit for passing through food. Windowless pits where you could be locked away and forgotten, scary stuff. The commandante listened to the entire story, and asked several questions of the girls. He particularly asked if they could tell if the driver or the assistant seemed to be part of the scheme. They explained that they didn't realize until afterward just what it was that had happened, but they didn't remember anything out of the ordinary from the driver or his assistant. He and Mahmoud further discussed the situation, then the commandante left for a few minutes. Mahmoud was apologizing for the terrible misfortune and explaining that it was very uncommon in Syria. We said that we understood that it was uncommon, and asked Mahmoud to explain to the commandante that we felt far safer in Syria than in many other countries, and had been very surprised to encounter even a minor crime. 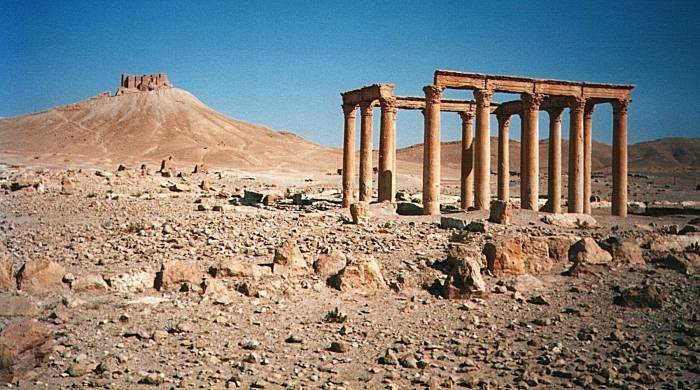 Most of Palmyra is open for exploration and you are free to wander around on your own. But a low-cost ticket is needed for the Temple of Ba'al. The commandante returned, and was glad to hear that this incident had not given us a bad impression of his country. He then explained that the minibus had already made some stops, and the police had determined that the man matching the girls' description was no longer on the bus. However, they would be taking the driver and his assistant into custody at the final stop and bringing them to Palmyra in a police vehicle. Also, the district general of police and his assistant would be coming "in a special car" to take part in the investigation. However, all the people would not arrive for a couple of hours. Mahmoud then took us to the Hotel Afqa to harshly talk to the manager, who then refunded a third of the money I'd paid for my somewhat gritty bed. We all thanked Mahmoud at great length, and I gave him half of what I had been refunded. That's baksheesh well earned! Kathleen and I explored the ruins of Palmyra, while Erin and Sarah waited in town for their apppointment at the police station. Returning late in the day from watching the sunset from the hilltop fortress Qala'at ibn Maan, we saw Mahmoud driving around the edge of town. He stopped, jumped out, and announced that Erin and Sarah had recovered their lost money. We found them at the hotel, and we all went to dinner where they told us the rest of the story. The district general of police and his assistant had arrived in the afternoon, as had the car carrying the now-nervous driver and assistant. Mahmoud picked the girls up and returned with them to the police station. The police had repeatedly asked the girls if they had any reason at all to suspect that the bus company personnel might have had any part in the crime, either active participation or passively allowing it to happen. They just didn't have any information, and while the driver and his assistant were almost shaking in terror, it wasn't necessarily because of guilt. The girls described it as a very disturbing feeling of having absolute power over another person. They knew that if they expressed the vaguest of suspicions, the two men would be thrown into the grim holding cells before disappearing further into the Syrian legal system. Saying, or even hinting at anything, would be like pulling a trigger. The girls said that they had no idea who the apparent thief was, and as far as they were concerned there was no indication that the bus company or its employees had done any wrong at all. The police then gave the girls 2,500 S£, saying it was reimbursement from the bus company. They probably meant that the police would extract the sum from the bus company under threat, and the bus company would probably turn around and extract it from the staff. My guess was that the driver and his assistant were at least passively involved, and so justice was probably served. If nothing else, the assistant should have seen what was going on in the fairly small minibus, and should have kept an eye on the proceedings, possibly warning the girls or the perpetrator to prevent the crime. The arguments in a foreign language about where to place the luggage should have raised suspicions. Well, it was pretty certain that the two of them wouldn't be causing any trouble in the immediate future, regardless of whatever they had or had not done that morning. I didn't know until much later that when Hefez al-Assad had his brother Rifaat massacre about a thousand Islamist prisoners in 1980, in retaliation for the Muslim Brotherhood's assassination attempt, it happened at Tadmur Prison just outside town. Hefez's son Bashar al-Assad closed the prison in 2001 after he had assumed power after his father's death. I can't help but remember that Syria is one of the countries where the U.S. has sent men seized in "extraordinary renditions", including a Canadian of Syrian background who seems to have been a victim of misidentification or misunderstanding. Maybe some of the outsourced torture on behalf of the U.S. took place in that recently closed facility. His sole concern was to find out what they wanted him to confess, and then confess it quickly, before the bullying started anew. He confessed to the assassination of eminent Party members, the distribution of seditious pamphlets, embezzlement of public funds, sale of military secrets, sabotage of every kind. He confessed that he had been a spy in the pay of the Eastasian government as far back as 1968. He confessed that he was a religious believer, an admirer of capitalism, and a sexual pervert. He confessed that he had murdered his wife, although he knew, and his questioners must have known, that his wife was still alive. He confessed that for years he had been in touch with Goldstein and had been a member of an underground organization which had included almost every human being he had ever known. It was easier to confess everything and implicate everybody. Besides, in a sense it was all true. It was true that he had been the enemy of the Party, and in the eyes of the Party there was no distinction between the thought and the deed. Looking south from the hilltop fortress of Qala'at ibn Maan over the Valley of the Tombs at sunset. 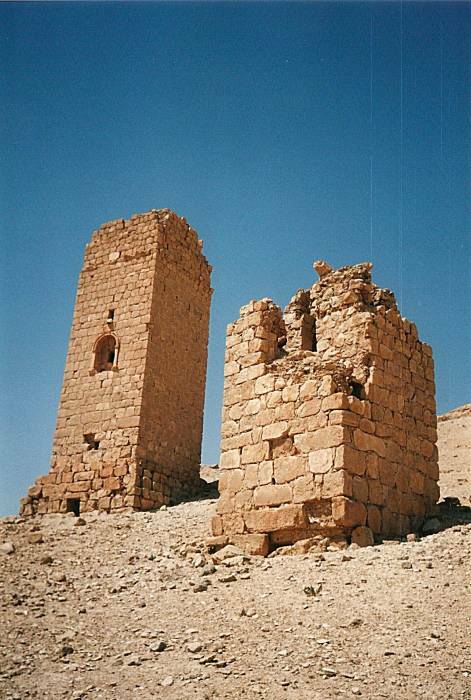 Some crumbling funerary towers at the southeast end of the Valley of the Tombs. 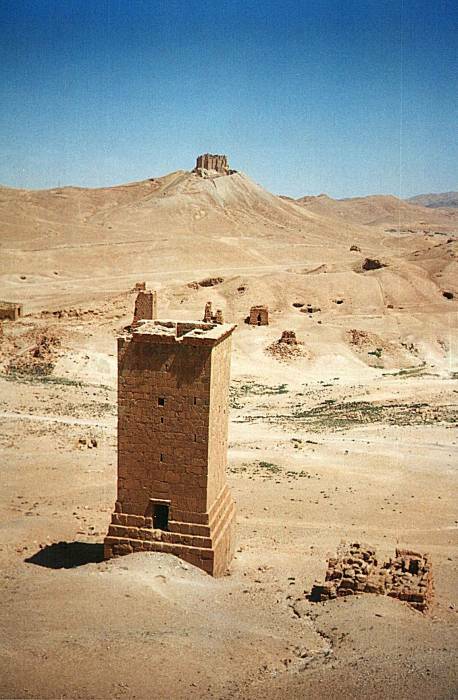 The Palmyran people built unusual square funerary towers. The Valley of the Tombs contains a series of these stretching for a kilometer or more, running up the valley to the west of the ancient city. They're square-sided towers, large and slightly tapering as they rise. 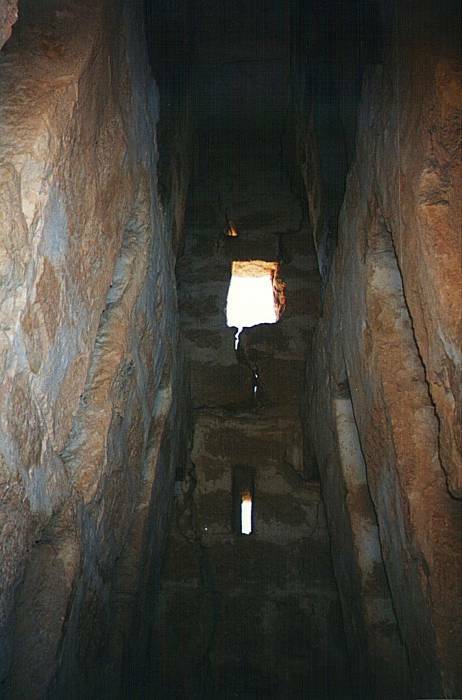 The interiors contain burial compartments. A closer view of those same funerary towers. A row of funerary towers further up the Valley of the Tombs. Make sure to take plenty of water and dress appropriately when you're exploring ruins in the desert! Most of the funerary towers are locked shut with iron gates. If you find the right person in town, you can rent a key to explore some. But if you look a little further away from town, you may find one or more that is open. See the tower in the last picture above. If you can climb from the drifted sand up to that open doorway on the nearest face, you can get inside. Here's a picture of its interior. The interior space tapers more sharply than the exterior, as the walls get thicker as they go up. It's an unusual design! Burial niches or compartments are built into the interior wall surfaces. Back when Palmyra was in its prime, the deceased would be laid out full length in these compartments. Limestone busts depicting the dead sealed the rectangular niche openings. The sculpture is all in museums now, in Damascus and overseas. These statues show the distinctive Parthian Iranian form and the Palmyrene script, a local form of the Aramaic script. This funerary bust and stele are in the Metropolitan Museum of Art in New York. Other images of Palmyrene art are easily found online. Blessed be his name forever, the good, the compassionate! 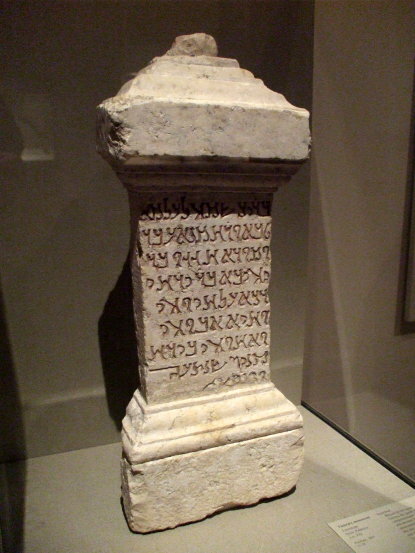 Made and devotes [this monument] Haggagu, the son of Yehîba, the son of Yarhai, the [—]; for his life and the life of his father and his brother. In the month Qinyan of the year 543 [July A.D. 232]. After a few eventful days in Palmyra it was time to take the Karnak long-haul bus to Damascus, my final stop. 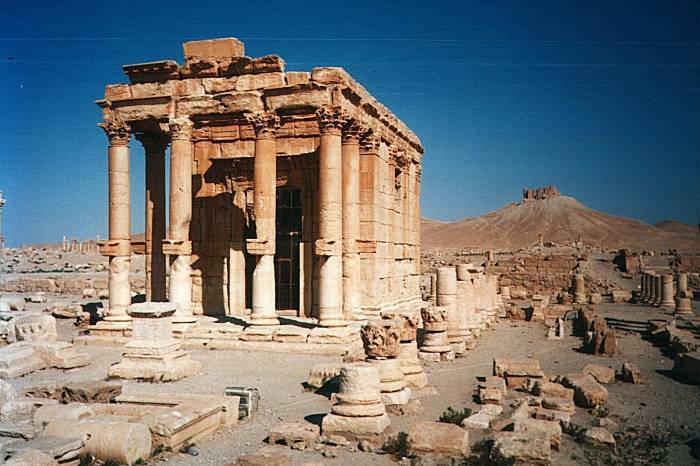 It's 200 kilometers from Palmyra to Damascus, the trip takes a couple of hours.